Tarie: Hi, everyone! 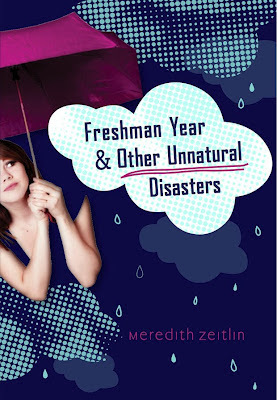 Please help me welcome YA author Meredith Zeitlin Into the Wardrobe! She's here to introduce her debut novel Freshman Year & Other Unnatural Disasters, which was released just this month! "Let's say you're fourteen and live in New York City. You'd think your life would be like a glamorous TV show, right? And yet . . . You don't have a checking account, much less a personal Black American Express card. You've never been to a club, and the only couture in your closet is a Halloween costume your mom made from an old laundry bag. In other words? You're Kelsey Finkelstein - fourteen and frustrated. Every time she tries to live up to her awesome potential, her plans are foiled. Kelsey wants to rebrand herself for high school to make the kind of mark she knows is her destiny. But just because Kelsey has a plan for greatness . . . it doesn't mean the rest of the world is in on it." When I first moved to Brooklyn, I babysat for an awesome little girl... who is now taller than I am, by the way. (Why?!?) Anyway, I would read her YA books while she did her homework, and with few exceptions, I found myself very bummed out by them. I thought they seemed cookie-cutter and not very well-written and, most importantly, not at all the sources of comfort I grew up with, which were filled with relatable characters who were awkward and desperately trying to figure things out. Instead these were all about super rich and sophisticated kids, the likes of which I certainly never met when I was fourteen. Since then, I've been turned on to lots of amazing contemporary YA writers – they are definitely out there! But at the time, I was so disappointed. I thought, maybe I'll write something myself. I had been writing a personal blog for a few years at that point (mostly to keep the creative juices flowing while I bartended and babysat and temped), which was basically an account of all the ridiculous things that always seem to happen to me. Of course, since I was a so-called adult, some of the recent adventures were a bit on the racy side, but I thought: What if I wrote a story that's about the disastrous things that happened when I was growing up? After all, I've almost completely recovered! So, I came home one afternoon and sat down in my living room and wrote the first sentence of the book – the same first sentence that you'll see in the finished version. I wrote a few pages and closed the computer. Then I watched a bunch of TV and ate some ice cream and thought: “I should really work on that some more.” Then the Procrastination Monster and I did everything BUT write for a while. And that was how the book got written, over about six months. When inspiration struck, I'd write something – for five minutes, or thirty – and then I'd do something else. I specifically remember when I realized I had an actual book; I was sort of shocked. This was the first major writing project I'd actually seen all the way through, and it was scary! Did I have to do something with it now? If so, what? And, of course, I had to figure out how the heck to end the book, which had me stumped for ages. The book changed a lot during the unusually long editing process (which involved my first editor getting let go amidst a typically Kelsey-like book editing experience. Why I ever expected things to go smoothly is beyond me). The tense changed from past to present, at one point there was a totally different narrative style, Travis had a much bigger part for a while that involved her being a child star, and Ben went through all kinds of incarnations. Ironically, the finished book is more like the original draft than any of the ones in between. But as frustrating as it was, all the work on unused drafts led to a clearer, more pared down book, so it was worth it. And the original story – and my original purpose – never changed. So, there you have it: the book about a catastrophe-prone fourteen-year-old is actually about a slightly older (yep, that's what I'm going with) Brooklynite who loves candy and TV. And sometimes pulls it together long enough to write a book that she hopes kids (and their babysitters!) will relate to and love. Tarie: Thank you so much, Meredith, and the very best of wishes for Freshman Year & Other Unnatural Disasters! 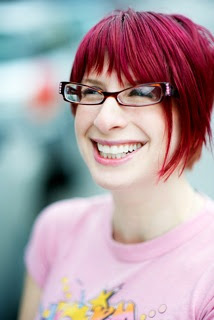 Hi Tarie, are you also an author of YA novels? Thanks.